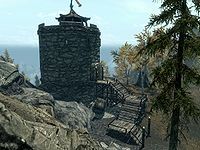 Rift Watchtower is a small tower in the northern Rift occupied by Orc bandits. This is a two-story watchtower, with a wooden structure leading up to the door, with an Orc bandit standing in front. There is another Orc bandit on the ground floor of the tower. You will find a pile of firewood to your left, with a tanning rack next to it. Opposite you is a table holding a mead barrel, a leg of goat, two leather strips, two garlic bulbs, a rock warbler egg, two raw rabbit legs, and a copy of The Code of Malacath. There is an open fire and cooking spit with a charred skeever cooking over it, which you can harvest for a charred skeever hide. There is a stone spiral-staircase leading to the top level to your right. Ascend this and you will be confronted by an Orc bandit and the boss. 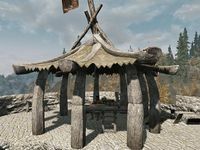 There is an Orc styled shelter atop the watchtower with a long wooden table and two chairs. On the table is a joint of raw beef, grilled leeks, a bottle of Nord mead, an enchanted Orcish warhammer, a copy of the Heavy Armor skill book Hallgerd's Tale, and a copy of The True Nature of Orcs. Behind the table is an unlocked chest, and to the left is a small table holding a random bow and arrows. There is an orichalcum ore vein to the southeast. The bandit leader (an unnamed Orc) does not respawn, which makes it impossible to complete radiant quests at this location if he has been killed previously. This page was last modified on 2 October 2015, at 02:38.